Tipard Blu-ray to iPad Ripper is the most powerful and all-in-one Blu Ray to iPad converter. It offers you mighty converting tools to rip Blu-ray Disc and DVD to iPad compatible video and audio format. And it can also serve as an iPad video converter to convert any popular video format to iPad. it can remove different copy protections of your commercial BD discs, like AACS, BD+, even MKB V17 which was newly published. It is the best and powerful Blu Ray Disc to iPad Ripper. ...... Tipard Blu-ray to iPad Ripper can remove different copy protections of your commercial BD discs, like AACS, BD+, even MKB V17 which was newly published. This best Blu-ray to iPad Ripper enables you to rip Blu-ray Disc to iPad compatible video and audio. Also it allows you to rip DVD to iPad. You are able to convert any popular video format to iPad video and audio format. The iPhone Transfer enables you to backup iPhone files on PC and transfer local files to iPhone. 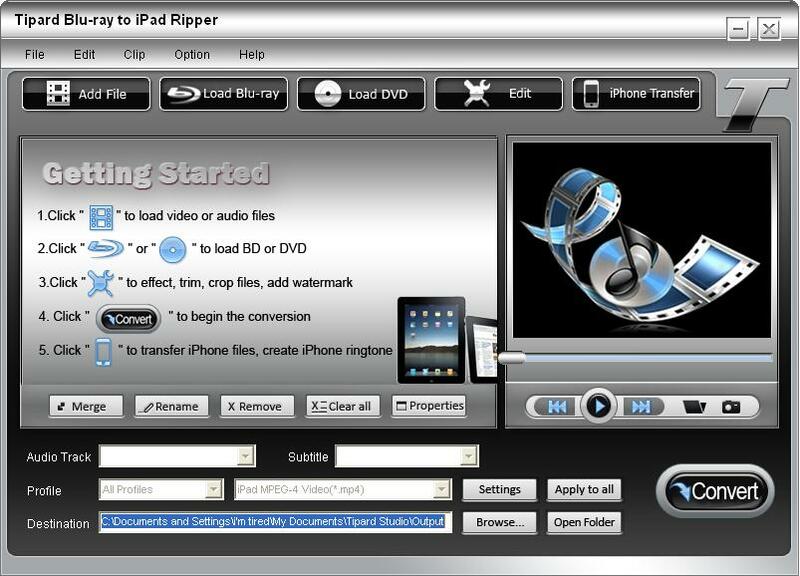 Tipard Blu-ray to iPad Ripper can assist you to trim any clip of a video and join video pieces together for better enjoyment. You are allowed to crop the video playing region and aspect ratio; and watermark your video as you like in the form of a text or image. best aid to rip DVD to video and audio formats for iPod, iPhone, PSP, Zune, etc. Qweas is providing links to Tipard Blu-ray to iPad Ripper 6.3.12 as a courtesy, and makes no representations regarding Tipard Blu-ray to iPad Ripper or any other applications or any information related thereto. Any questions, complaints or claims regarding this application Tipard Blu-ray to iPad Ripper 6.3.12 must be directed to the appropriate software vendor. You may click the publisher link of Tipard Blu-ray to iPad Ripper on the top of this page to get more details about the vendor.